The C Class numerical control line can be installed on a wide range of machine tools: from traditional milling and boring machines to machining centres, including the most complex high speed milling systems. The C Class products offers advanced features of functionality and flexibility to manage high levels of automation, from the simple pallet changer to the more complex FMS systems. A wide range of hardware and software solutions, combined with a linear and compact design, ensure a high level performances for the milling of moulds and dies, models, aeronautical and general mechanical components. The architecture with two separate processors, one for the operator interface and one for the real time, enables high milling performance in terms of quality and speed to be achieved. Moreover, thanks to Windows® 7 and the hardware solutions integrated on the C20, it is possible to install other applications for programming, measuring, monitoring etc. To use at their best the NC features, Fidia also provides its XPOWER digital drives. A wide range of power modules can drive all the most common motors installed on machines tools: brushless, linear and torque motors, synchronous and asynchronous spindles. 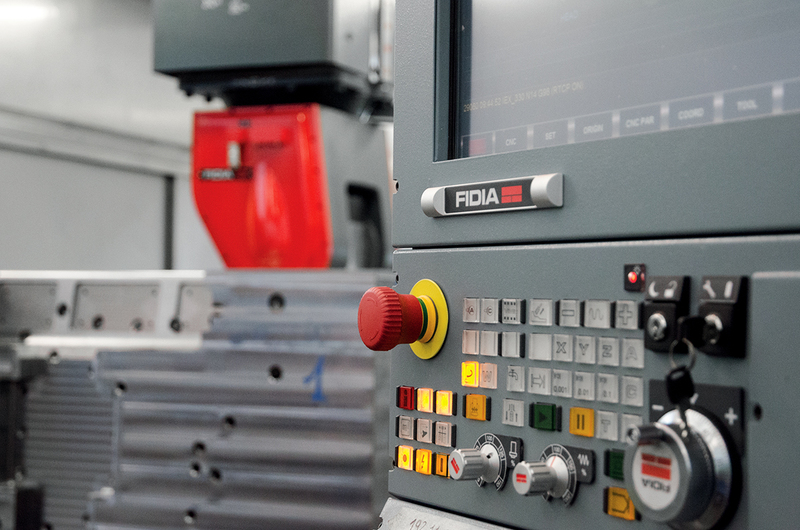 This means that Fidia provides all the electronic parts of the machine and guarantees its performances, functionalities and service in every part of the world. The expertise and professional competence of Fidia Service Dept. integrated in the supply ensure the investment’s validity in time. Fidia controls have always been appreciated for their high level performance and for the comprehensive range of features supplied as standard. The architecture of Fidia NCs, with two separate processors, takes full advantage of the power of the dedicated CPU for axis and PLC management, based on a RISC Power PC. The PC section manages the operator interface: in this way, any programming or display task, even an onerous one, can be performed without interfering with the machining in progress. 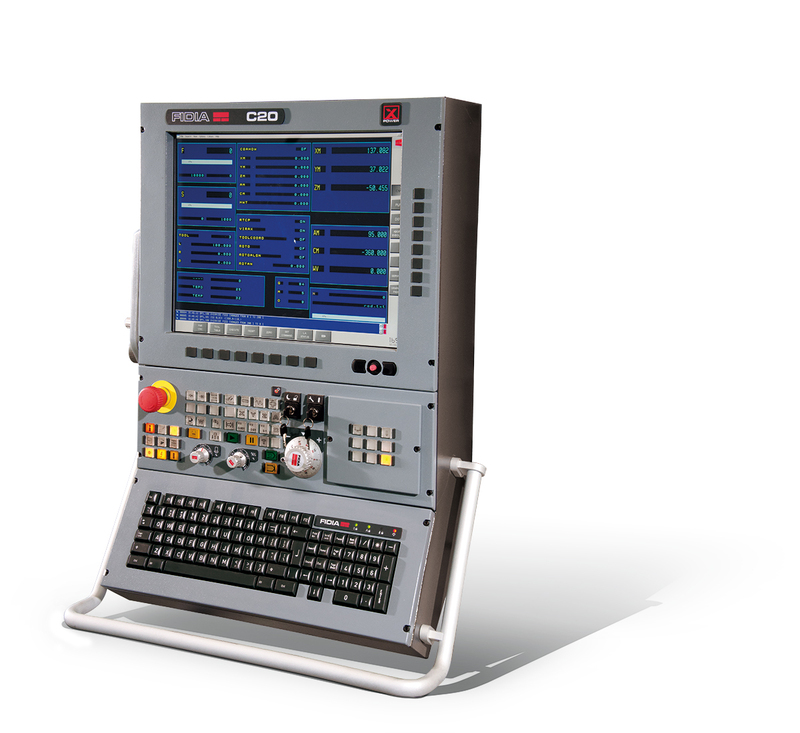 Applications integrated with the numerical control can also be developed owing to the standard CORBA interface that makes the Fidia NC open to the most widely used operating systems and programming languages. Through the CORBA developing kit and its interface licence is possible to read, by TCP-IP, NC parameters and PLC registers. The Fidia C20 high end control can be equipped with a 19“ LCD TFT display. Apart from the Fidia software applications, it also supports other software products, such as Viewer CAM systems or measuring software that may run in parallel. The IPC – CNC rack comes up with state of the art PC hardware and a Microsoft operating system. The C20 pushbutton can also have an additional 9 buttons kit for a better customisation of the machine functions. In order to enable control from two areas for machines with long axis travel, a second operating panel with LCD TFT display and keyboard can be connected. 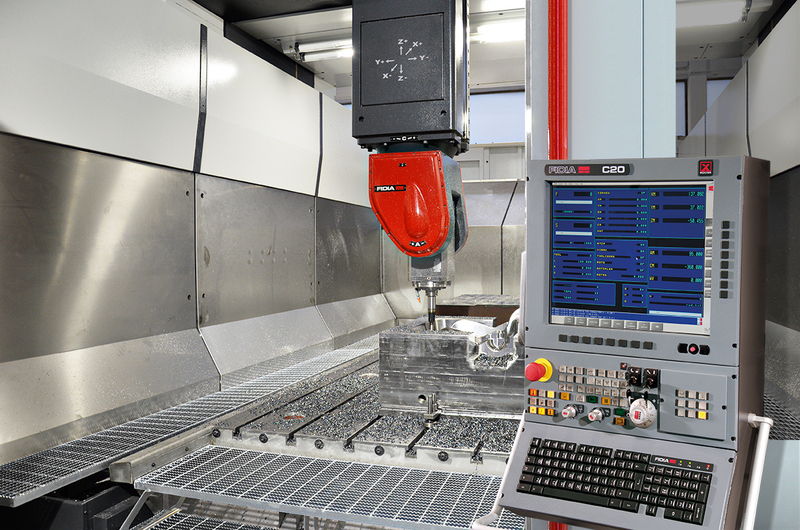 The C20 fulfills highest demands for complex applications where 5-axis HSC machining with RTCP and a large number of drives (Gantry, Tandem, multiple axes) must be managed simultaneously. The C20 manages complex upper Gantry machines with 12-14 motors for 5 axes as well as heavy portaltype machines with different exchangeable head systems and spindles. It is possible to manage up to 32 digital drives with linear motors, torque motors or conventional motors. The C20 is therefore the right choice for all complex machines. The numerical control structure allows for simple and fast updating of NC software as well as ISOGRAPH and HI-MILL applications. The NC architecture with its double processor also allows for hardware upgrades by replacing all or part of the PC (memory, hard disk, network boards) without modifying the other components. In this way, the control can always be kept up to date by implementing both hardware and software innovations as they become available. The graphics environment is intuitive and easy to use, while the set up of operations on the numerical control is further facilitated by the use of softkeys. 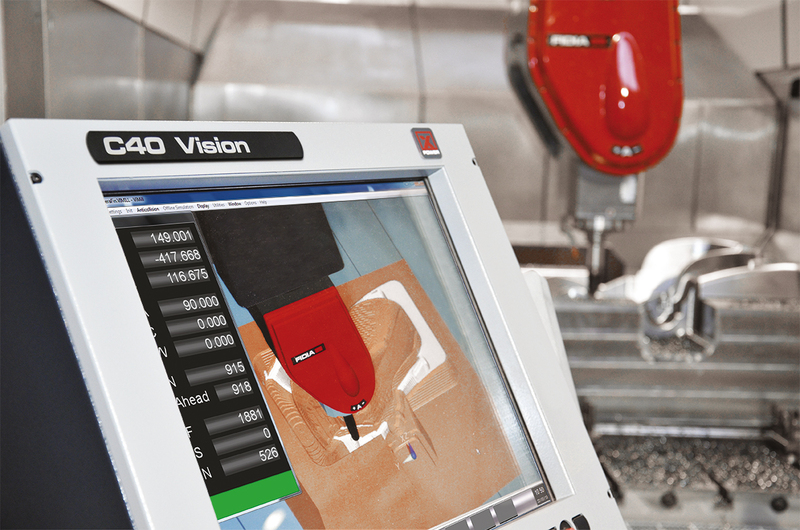 Switching between different operating environments (CNC, ISOGRAPH, HI-MILL) allows the user to perform simultaneous tasks with complete safety. Simulation of machining programs and graphic visualization of tool path both before and during the machining. An optimized and even simultaneous visualisation for displaying large and different format files enables a quick check of the milling path. management of ISO-DXF/DWG-IGES-STL-VDA-FS-PRJ (HI-MILL project) formats. Although the technical department usually checks all CAM programs, for several reasons (machine change, unexpected overall dimensions, change of the origins) the milling path could not be suitable for the machining. In such cases the tool path should be newly calculated, partially or in full, or the file should be modified (movement release clearance, shift of origins, axis switch, etc.). On Fidia controls instead, the operator can directly activate all these variations (roto-translation, scale factors, axis change, etc.) to the aid of suitable parameters but with no need to perform corrective actions on the part program. In addition to this, where changes are to be applied with a specific sequence on file parts or on several files, the programming through Procedures is provided allowing for an easy and maximum automation of part program sequences thus resulting in maximum efficiency. It enables to define up to 10000 tools identifiable with a 16 alphanumerical name that can be called from the part-program. The table can be customized by inserting fields handled by the PLC and can be exported according to the Windows® standard formats. Also the visualization can be customized by choosing the columns and by defining the sort order of rows. The tool table completion can be performed directly on the machine or it can be done externally and then transmitted to the NC via the network or via the USB port. The combination with the tool identification systems results particularly useful within a tool centralized management. To avoid time-wasting operations on the machine it may be useful to use the FIDIA piece alignment features. To this purpose some specific dialog pages with graphic support can guide the operator in calculating and activating the suitable rotations. The alignment cycles can be performed with digital probes or more simply with a tool: in the latter case the points have to be collected manually. Several cycles are provided referring to the geometrical elements available on the piece: working surface, holes, pins. On machines with swivelling head, rotation for piece alignment may also be applied to rotary axes, so that even in 5-axis paths the tool will keep the proper orientation in relation to the piece.